The King of Swords sits upon his throne of command, holding a large upward-pointing, double-edged sword in his right hand, while his left hand rests gently upon his lap. On his left Saturn finger is a ring, symbolic of power and taking his responsibilities seriously. The King wears a blue tunic, symbolic of a desire for spiritual understanding, and a purple cape, symbolic of compassion combined with intellect. The back of his throne is decorated with butterflies (transformation), crescent moons and an angel just near his left ear, positioned as if to give him subtle guidance. The sky is relatively clear with a few clouds, representing general mental clarity. The trees in the background appear motionless and reflect the stern judgment of the King. The King of Swords is a symbol of intellectual power and authority, and has the courage and intellect to accomplish all that he desires. He represents judgment, command, and ruler-ship. His character indicates the stern leadership of a judge, lawyer, or military commander whose emotions must be kept in check under the pressure of battle. 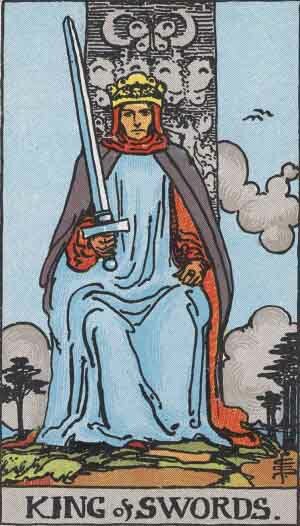 Therefore, the King of Swords asks you to remain detached and objective in a specific situation, in order to ascertain the truth and seek out only the facts. You need to use your intellect to prove your point and succeed. Your education and experience are important but so are your day-to-day observations and thoughts. You can also solve problems by using history, rules, laws and diplomacy. The King of Swords suggests that you need to adopt a very stern but fair role. You have clarity of mind and can perceive the truth right now, so you must take the lead with providing an objective point of view. You are well-positioned to judge your situation appropriately and identify the limiting behaviors that are getting the way. This is a time when you need to leave emotions out of it, and remain as objective and rational as possible. You may need to reason with others and be quite direct about what you are observing. You may be concerned that you are not being particularly caring or sympathetic but at this point in time, this detachment is what is needed most. Similarly, the King of Swords encourages you to use your logic and intellect to navigate your path ahead. You will need to get to the heart of the matter, make firm and well-researched decisions, and ensure that you are firm but fair in your dealings with others. You need to be able to take any situation, look at it with total impartiality, and then come to a decision that is both fair and insightful. Oftentimes, the King of Swords represents a professional advisor, such as a solicitor or attorney, financial adviser or taxation consultant. This advisor has a solid reputation and a vast amount of knowledge in his particular field, and will provide you with objective, well-researched advice about your own situation. He is completely impartial, and will draw upon his experience and his innate knowledge of the rules, systems and structures that are in place. He may come across as detached or disinterested in your personal circumstances, unless it relates specifically to the type of advice he is giving you. This is so that he can provide only the most relevant and objective advice to you. He prides himself in his expertise and qualifications, and is likely to charge a high fee for his services. Nonetheless, he offers the rigor and specialist knowledge that you need right now. If you have not engaged the help of an expert, the appearance of the King of Swords suggests that it may be worthwhile getting some legal or financial advice. If you are expecting changes or particular circumstances to arise that will require expert advice, you can be on the front foot by seeking advice before they happen. That way, when they do roll through, you are ready to demand your rights and seek an outcome that benefits you. You may also benefit by finding an advocate or mentor who will look out for your needs and who can provide you with objective and smart advice about what to do. This King is also a man of the highest ethical standards. It is impossible to corrupt him and as such he acts as a pillar of strength who gives sound advice to everyone, no matter who they are. What is more, he firmly expects others to operate by the rules of the law and will not tolerate others who break the law. As a father, for example, he will become very angry if his children do not follow the ‘house rules’. I will be gone for the weekend in honor of Samhain (Halloween) the end of the Year for me in the Pagan Tradition. I will be back next week to give you more daily Tarot messages. Have a wonderful and safe holiday.